Newspaper Rock: FSU's Seminole mascot is "stunting"
By Eddie PellsA student sitting atop a speckled Appaloosa and wearing a headdress and war paint will ride to the 30-yard line before the BCS title game and plant a flaming spear into the turf. Some might cringe at the 35-year-old tradition carried out by "Osceola" and "Renegade" — the Florida State mascots that will lead the cheering when the Seminoles play the Auburn Tigers for the national championship Monday night. But in a football season shadowed by controversy over the Washington Redskins nickname, nary a complaint has been heard out of Tallahassee, Fla., where "Seminoles" is more or less synonymous with the university, its football team and, of course, winning. The key reason: The Seminole Tribe of Florida counts itself among the very biggest fans of Florida State, its nickname and all it represents. "The relationship is treated with reverence," said Liz Maryanski, Florida State's vice president for university relations. "We are very respectful of them and we honor them because they, frankly, allow us to use their name." The university, in fact, refuses to call the horse and rider its mascots, choosing instead to call them symbols of the Seminole that represents the school's sports teams. Neither tribal President Tony Sanchez Jr., nor Chairman James Billie responded to interview requests from The Associated Press. But in an interview last month on CNN, Billie made it clear that neither the Redskins controversy nor any other outside force would alter the position tribal leaders agreed upon decades ago. 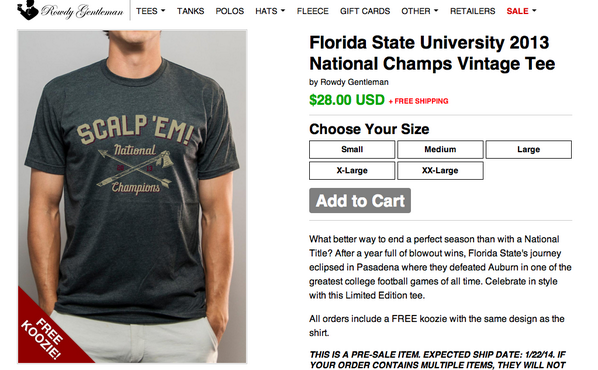 Florida State does the Seminoles proud. By Glenn BoggsSo, what does this brief review of Seminole history in Florida teach us? Surely the lesson is that the men and women of the Seminole Tribe of Florida showed incredible courage, tenacity and skill under pressure, and the will to never, ever surrender. Of course these are precisely the attributes to hold up before the eyes of our university's athletic teams. And Florida State does just that. During the almost three decades I spent on the faculty, my impression was that the administration was uniformly solicitous of and attentive to the Seminole Tribe's viewpoint regarding the use of Seminole images and symbols. For example, just look at the dauntless statue of a mounted Seminole warrior located just outside the football stadium–it's named 'Unconquered ', and it is stunting. Anyone should be able to see that FSU's use of Seminole imagery and symbols is undertaken with great respect for the Tribe and, speaking as one retired professor, I'm grateful to them for allowing the university to do so. The fact that Florida State University is able to honor some of our state's Native Americans should be something for Americans to celebrate, and understanding a little Seminole history should help accomplish that.Note that he wrote "stunting," not stunning. Correct. This phony statue of a mounted warrior--the Seminoles didn't ride horses--stunts our knowledge of Native history. It makes the Seminoles into stereotypical horse-riding savages and nothing else. These defenses of the "stunting" Seminole mascot sound okay. They've got the tribe's approval and everything. So what's the problem? By Dave ZirinIt’s easy to oppose the name of the Washington Redskins and call for owner Dan Snyder to change his beloved bigoted brand. After all, it’s a dictionary-defined slur bestowed on the NFL franchise by their arch-segregationist, minstrel-loving founder. When you have Native American organizations, leading sportswriters, Republicans as well as Democrats in Congress and even the president say the time has come to change the name, it is not exactly difficult to get on board. I have been to dozens of Redskins game and have never seen anything close to this kind of mass interactive minstrelsy. Yet there are no protests against this spectacle, no angry editorials and no politicians jumping on the issue. Why is that? Because as any Florida State fanatic will shout at you, the university has “a formal agreement with Seminole Nation” and that makes everything all right. Fans treat this much-touted agreement like they have a “racism amnesty card” in their back pocket. The approval of the Seminole Nation, they will tell you makes it all A-okay. Actually it doesn’t. It doesn’t first and foremost because the existence of this “agreement with the Seminole Nation” is a myth. As for the Florida Seminole Tribal Council, it is the owner of a series of luxury casino hotels throughout the state where the Seminole “brand” is prominently on display. The Tribal Council also bought the Hard Rock Cafe for $965 million in cash in 2006, which thanks to the Seminoles’ “first-nation status” now also offers gambling in its Florida locales. Hard Rock corporate called this “the perfect marriage of two kindred spirits.” Seminole Nation Hard Rock Hotel and Casino T-shirts are available for purchase. Some might say that this is fine with them. After all, given the incalculable wealth stolen from Native American tribes over the centuries, what is wrong with them getting some of it back? That would be fine, except for the stubborn fact that gambling wealth flows into very few hands. The majority of Native Americans languish in dire poverty, with reservation poverty listed at 50 percent in the last census. Another argument for the Florida State Seminoles’ keeping their name is that it actually educates people and keeps the history from being eradicated. This is self-serving codswallop, like saying a Muhammad Ali mousepad teaches people about his resistance to the war in Vietnam. Branding and cultural appropriation is not history. It’s anti-history. Take school mascot Chief Osceola as an example. If people in the stands and at home actually knew who Osceola was, the ritual of his riding a horse and throwing a spear before games would be an outrage, and not just because the Seminoles, who lived and fought in swampy everglades, tended not to ride horses. Chief Osceola was a great resistance fighter and leader of the Second Seminole War in Florida. Osceola was nothing less than the American Mandela, but a Nelson Mandela who did not survive Robben Island. Imagine before a South African soccer game, a white person in black face, dressed like Mandela, running out to midfield to psyche up the crowd. Not even Rick Reilly would say that this was somehow educating people about African resistance to apartheid. No one is getting educated about Osceola or the Seminole Wars. Instead their heroic resistance has been translated for football purposes to being “tough.” This “respect” for their toughness not only reduces a rich and varied Seminole culture to a savage culture of war, it is also an unspoken way to to praise our own ability to engineer their conquest. The last argument, which is perhaps the most common, is, “Changing the name of the Redskins the Seminoles… where does the politically correct madness end? Do we stop using ‘Giants’ because it offends tall people? Or ‘Cowboys’ because it offends cowboys?” This kind of witticism is actually profoundly insulting because there was this thing called “history” that happened, and in this “history” giants were not subject to mass displacement and genocide. Once 100 percent of this country, Native Americans are now 0.9 percent, and we play sports on their graves. Their rituals and dress are our own commercialized entertainment. We turn our eyes to the field and away from the way institutionalized racism continues to define the lives of the overwhelming majority to Native Americans who do not own a stake in the Hard Rock Cafe. That gets us to the final problem with Seminole nation and all Native American mascoting. It makes us more ignorant about our own collective history. I’m not sure we can afford it.This is the problem with all mascots in a nutshell:This “respect” for their toughness not only reduces a rich and varied Seminole culture to a savage culture of war, it is also an unspoken way to to praise our own ability to engineer their conquest.Below is one of the many problems that Indian mascots engender. Naturally, the mascot's defenders, including Florida's Seminole tribe, can't or won't explain these problems. For more on the Seminoles, see EPSN's Seminole Minstrel Show and Why FSU's Seminoles Aren't Okay.